Again, will post more pics in a separate post. This one was taken in my actual kitchen, which is small, but not THAT small!! These kits from China really are brilliant, this one only cost me about a tenner and included everything I needed, except I did use different adhesives to the one supplied. Wow, Annie, your Wanderlust spread is absolute gorgeousness! I was going to skip this lesson, but now I'm thinking perhaps not! Love the miniature kitchen - you could make some people for it - not sure how though! Will look out for your separate posts to learn more about these projects ;) Got you in today nice and early LOL at #11! Happy WOYWW! Wow what a lovely kitchen & wished mine looked like that Annie. A lovely looking journal page as well. Morning Annie. What a beautiful journal page. And as for that kitchen - stunning. The contrast between the two projects is just amazing. Well done, girlie. Beautiful mini room. That must have taken a lot of work. Your journal page looks so beautiful and colourful - cheers me up on a dull, grey day. 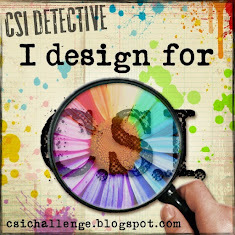 CSI Case File 222 - #Fabulous!! Remember - Happy 5th Birthday CSI! !